We are one of the renowned traders of the Hospital Equipment, which are available inn different specifications as per the clients’ diverse requirements. These products are fabricated using optimum quality materials and modern technologies, which make them more durable and enhance their strength. 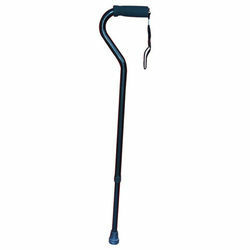 These strong and sturdy walking sticks are fully made from anodized aluminum. They come equipped with non-slip rubber caps. Comfortable and cradling armrests support and stabilize. Ergonomically improves arm positioning, keeps arm in place, prevents hands dangling near wheel and promotes proper seating alignment. Cushioned surface protects fragile skin, helps prevent pressure on the ribs. Easily fits onto wheelchair armrests. our glass shape helps rest the knees comfortably. The comfortable adjustable strap allows the pillow to remain stationery for an uninterrupted rest giving support all through the night. We are thye leading manufacturer of Pill Cutter. Pill Organizer from Pedder Johnson. This is a compact, plastic organizer for medications, vitamins etc. for all 7 days of the week. It is hardwood board with the tapering edge for easy sliding. It is used to transfer the person from wheelchair to car, bed or chairs. A smooth finishing and tapered edge enable easy sliding. We are among the leading traders in industry, engaged in offering a large gamut of Walker. Ergonomically shaped these walkers are easy to close and open and light in weight. These walkers have two buttons, which allow easier folds and strong grips. Their easier silos folding allow convenient transit and storage. Our vendors have made the use of best grade raw materials sand latest technologies in a fabrication of these walkers. Relying on our expertise in this domain, we are into offering Aluminum Commode Chair. Aluminum-Folding-Arm-Support from Pedder Johnson are Strong sturdy aluminum pipe walking stick with metal base legs for strong stable supports, adjustable height and non-slip grips to give comfort. Arm-Support-MS by Pedder Johnson is a light weight crutch that features full cuffs, combining comfort with support.Height adjustments are secured with durable metal pins.